Today, we cover the additional Gun Safety Rule – Be aware that certain types of guns and many shooting activities require additional safety precautions. My prior articles covered the three Fundamental Rules of Firearm Safety (i.e., Always keep the gun pointed in a safe direction; Always keep your finger off the trigger until ready to shoot; and Always keep the firearm unloaded until ready to use). Also, we covered other gun safety rules (i.e., Know your target and what is beyond; Know how to use the gun safely; Be sure your gun is safe to operate; Use only the correct ammunition for your gun; Wear eye and ear protection as appropriate; Never use alcohol or drugs before or while shooting; and Store guns so they are inaccessible to unauthorized persons). (Rule source: NRA). Certain types of firearms may require additional safety rules or procedures. These are commonly located in the firearms’s owner’s manual. For example, Muzzleloading firearms have additional safety rules. They include special procedures on how to determine if the firearm is loaded. Also, there is a rule that powder should always be loaded into the barrel by the use of a separate powder measure. Thus, you should never load the firearm from any type of large container. The reason is that hot embers could cause the gunpowder to ignite resulting in the container blowing up. Other rules, include: keep the powder container closed except when dispensing powder; don’t load while smoking or around any open fire source; only use black powder or an approved black powder substitute (consult your owners manual); etc... . There are additional rules. If you desire to shoot Muzzleloaders, I recommend taking the appropriate NRA Muzzleloading course. Also, you may desire to engage in various types of shooting activities, whether for training or sport. For example, I.P.S.C. (International Practical Shooting Confederation) competitions have extensive rules covering safety matters, including: safe angles of fire; suitability of backstops and side berms; minimum distances from metal targets; location of targets relative to the competitors, officials and spectators; safety areas; restrictions on types of holsters (e.g., no shoulder holsters), etc... .
Another example is that the procedures for loading your firearm and commencing fire are different in NRA bullseye shooting than they are in NRA Action Pistol competitions. Dry - fire practice is an important aspect of enhancing your defensive shooting skills. However, again, there are additional rules to ensure safety. Thus, the firearm must be completely unloaded; all dry-firing is to be done in a dedicated dry-fire area having a safe backstop at which the gun is pointed; no live ammunition is allowed in the dedicated dry-fire area; if reloading drills are performed, only dummy ammunition is used; and eye protection must always be worn. Again, always be sure the firearm is pointed in a safe direction. Many of you may recognize that home defense scenarios with a shooting partner can help you role-play various confrontational "what if" situations. Typically, one person will assume the role of the home defender, and the other person takes on the role of the attacker or intruder. However, NEVER perform role-play exercises with an actual firearm, even though you know it to be unloaded. Always use a non-firing firearm simulator made for training use. These simulators are typically made of rubber or plastic and are brightly colored so as to be easily distinguishable from real firearms. Never use a toy gun or a replica firearm (Source: NRA). Additionally, you should not otherwise have any actual real firearm or weapon on your person during these drills. I also recommend that you should not have any loaded firearms in the room(s) which you are conducting the exercises. In the ShastaDefense.com concealed weapons class, I give instruction in the proper step by step procedures for drawing from a strong side holster and re-holstering. 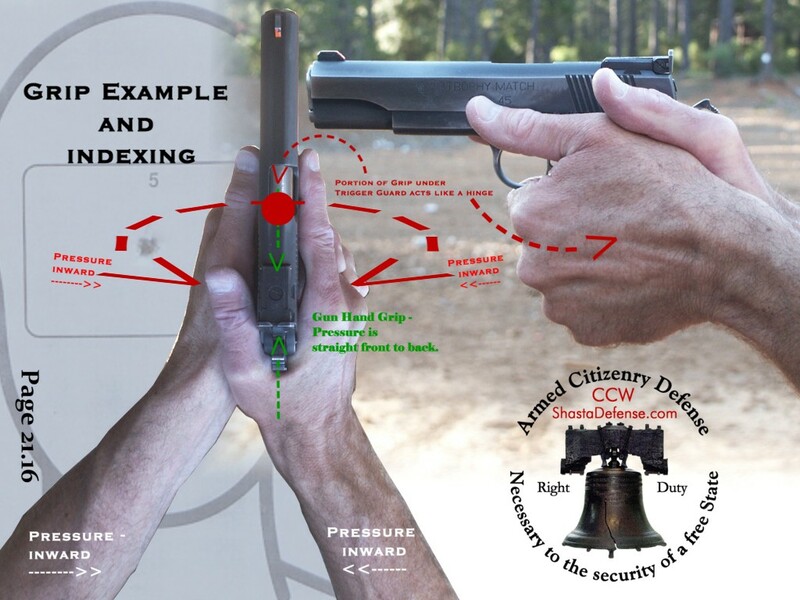 Not all CCW courses provide such instruction. However, in my view, you, as an American Citizen carrying a concealed weapon, must know how to safely draw and holster it. Failure to perform these procedures properly may result in injury or death.